Clarence Eckerson has been following our #sidewalkhogs competition while in South America. He sends this photo from Buenos Aires. This is a logical alternative to the piles of garbage that obstruct and stink up city sidewalks, attracting vermin and even endangering pedestrians. How nice it would be if NYC, where so many people can barely conceive of using street space for anything other than automobile storage, could get behind it. Maybe Clarence can find out if these bins require community board approval. Barcelona does the same thing. I wouldn’t be surprised if street-situated dumpsters were common outside the United States. But think of the Sanitation Jobs! These little bins are also at designated spots the ends of streets in Istanbul. Everyone on the block fills them up with trash. Every night a little truck comes, picks them up with a winch and dumps the trash into their trucks. The drivers maneuver everything from inside the truck with amazing skill. This would be especially helpful in winter, when piles of garbage were covered with snow and made the sidewalks even more impassable than they already were. It’s probably much easier to shovel one of these out than fifteen garbage bags. It’s pretty sad that pedestrians (i.e. human beings) are expected to share space with trash, but space used to store autos is so sacred that we would never dream of tainting it like this. The sidewalk near my apartment is especially narrow, perhaps 5-7 feet. It is effectively reduced to 3-5 feet on trash nights. Since the street is mainly medium-sized buildings, it wouldn’t take more than a handful of these (one for each building) to outfit the whole block face. I bet if an intrepid individual or block association got the necessary buy-in from the (non-car-owning) majority on a block, DOT/DSNY would create the necessary regulations for this type of thing arrangement. Yes, it would require CB approval. -make everyone slightly more aware of the amount of detritus they themselves actually generate since individuals would actually have to take out their own trash rather than throw it down a chute or put it outside their apartment door and forget about it. …that last reason is the reason it is quite unlikely to ever be accepted here. Once people think about what it will mean for them they won’t want to be responsible for their own garbage, let alone forfeit a few parking spaces. I have never paid attention to how cities outside the U.S. handle their trash. Probably because it wasn’t piled up everywhere. As much as I love NYC and would probably never live anywhere else, even I’m forced to admit that many things about this city are “third world”. That includes not only our system of waste disposal, but also the abysmal condition of much of our essential infrastructure. I wonder if any other first world city the size of New York has vermin problems of the magnitude we do? NYC always takes top honors for the quantity/size of our rats and roaches. That’s a distinction I wish we didn’t have. Some might complain that these things are ugly, but they’re no less ugly than overflowing garbage cans or piles of plastic bags that get ripped or chewed by vermin. And they’re certainly no uglier than the cars or graffiti-covered vans that line some NYC blocks. NYC is way behind the times on using street space for the common good. Yes YES YES–I’ve been saying this for years! 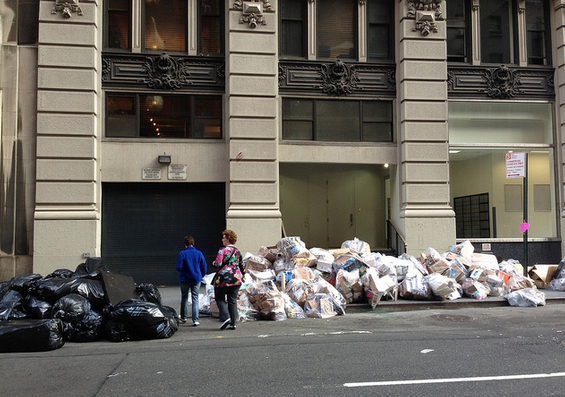 Real Cities don’t pile garbage in heaps like a mini-landfill in front of each building. It degrades the sidewalk environment tremendously (not just the piles but stains from trash juice and garbage cans as a centerpiece in front of every building). Sanitation workers have to perform the inhumane task of dragging thousands of dripping bags to the truck. Is this even being considered as part of PlaNYC? Since we don’t care about anything but war and terrorism in the USA (snark, but let me have my say…), I would also add that massive piles of trash everywhere provide a great opportunity for terrorism versus controlled, regularly-emptied (perhaps locked at certain hours?) bins. Funny, I’ve noticed the orderliness of other cities. 🙂 Small things matter so much — like not using poured concrete sidewalks and keeping all the rubbish in a tidy place. Also, European cities have recycling bins on most sidewalks, whereas in NY, most bins are trash only. This should have been done yesterday. Why is this not in PlaNYC? How can we generate some buzz around this? 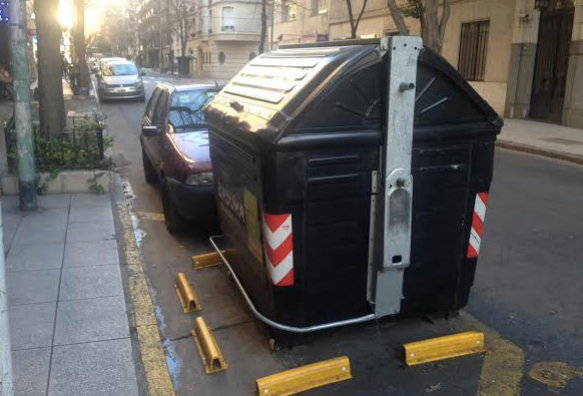 Buenos Aires also likes to put their garbage bins in bike lanes FWIW. If we did implement this, then sadly we’d miss all that horrible stench every day on NYC streets. Sad. Okay, not really. I see no reason why building staff can’t regularly move garbage from the basement at the bottom of a chute to a receptacle on the street. That last reason is truly not necessary. WOW! We NEED that in NYC! I have never seen anything like that, that looks so neat and efficient. If the system is phased in one neighborhood at a time over a long enough period, there’s no reason the reduced workforce can’t be handled entirely via not replacing retiring workers. I think it’s more a general American exceptionalism that thinks the way things are are the way things should be. The status quo is hard to change. That’s persuasive. We all already know from reactions to transportation proposals that just because it works in countless cities across the globe, it’s sure to be a failure in NYC. Pedestrian area, streetcars, bus rapid transit, bicycle infrastructure… all are *clearly* not compatible with the oh-so-special City of New York. That said, better garbage collection techniques doesn’t have to mean any reduction in the workforce. They could simply do *other* things that many other so-called ‘world-class’ cities do… litter collection, etc. Or maybe even ‘vacuuming’ the sewer drains *before* businesses and homes are flooded…. All over the country garbage trucks have a crew size of one. In NYC two minimum. Union rules. NYC exceptionalism maybe, not american. Have the extra dsny guys clean up sidewalks and parks. No job losses. Just a cleaner more efficient city. Moving trash has a cost, somebody has to bear it. Yes, right now building staff typically have to move trash from the cellar, basement or back alley to the front of the building. If they also had to move it to a receptacle half or even a quarter of a block away that would add considerable time, especially if the building doesn’t have the facility to store material handling equipment like wheeled bins. That cost will have to be borne by the residents. The public on street receptacles I’ve seen abroad, and everything mentioned here all seem to rely on individuals to carry their own trash, and in so doing prod them to think about how much they have to carry…which is a secondary but still laudable goal. Whether they have to carry their own trash or pay for a service that they already get ‘free’ (courtesy of the sanitation department) I don’t think most people care enough to actually go through with this when they are presented with the changes they will have to accomodate. Interestingly, as it stands truly large buildings that have the space to store large tipping bins can and do use them (look at large NYCHA complexes for example). Go to any large public housing complex in the city and you will indeed see something just like it. New York City in 2017 has several car-free blocks and pedestrianized street segments where traffic once rules, like Plaza 33 and Myrtle-Wyckoff Plaza. But unlike several other world cities, New York still doesn't have a connected grid of car-free streets. It would be a terrible mistake to replace clumsy short-term security theater with clumsy permanent security theater.